Definition at line 2535 of file commctrl.h. Definition at line 2540 of file commctrl.h. Referenced by debuglvcolumn_t(), FileTypesDlg_InitListView(), init_listview_columns(), InitializeRecycleBinDlg(), InsertColumnToListView(), and LISTVIEW_GetColumnT(). Definition at line 2538 of file commctrl.h. Referenced by add_lv_column(), CDowloadingAppsListView::AddColumn(), CAppsListView::AddColumn(), column_fill_hditem(), Control_CreateListView(), CreateListView(), CreateListViewColumns(), debuglvcolumn_t(), FileTypesDlg_InitListView(), init_listview_columns(), CNetConnectionPropertyUi::InitializeLANPropertiesUIDlg(), InitializeRecycleBinDlg(), InitInstance(), InitListViewColumns(), InputPageInitListViewColumns(), InsertColumnToListView(), LISTVIEW_GetColumnT(), and msi_dialog_vcl_add_columns(). Definition at line 2537 of file commctrl.h. Referenced by CDowloadingAppsListView::AddColumn(), CAppsListView::AddColumn(), column_fill_hditem(), Control_CreateListView(), CreateListView(), CreateListViewColumns(), debuglvcolumn_t(), FileTypesDlg_InitListView(), CNetConnectionPropertyUi::InitializeLANPropertiesUIDlg(), InitializeRecycleBinDlg(), InitListViewColumns(), InputPageInitListViewColumns(), InsertColumnToListView(), LISTVIEW_GetColumnT(), LISTVIEW_InsertColumnT(), and LISTVIEW_SetColumnT(). Definition at line 2543 of file commctrl.h. 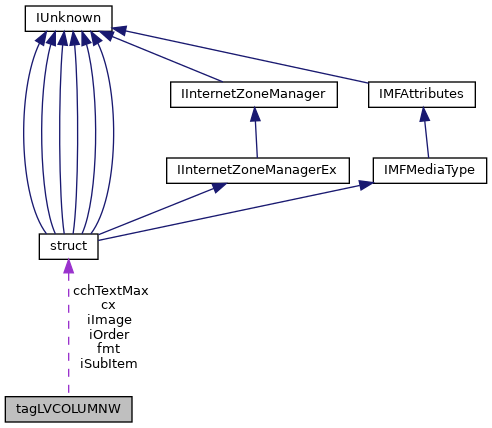 Referenced by column_fill_hditem(), debuglvcolumn_t(), and LISTVIEW_GetColumnT(). Definition at line 2544 of file commctrl.h. Definition at line 2541 of file commctrl.h. Referenced by CDowloadingAppsListView::AddColumn(), CAppsListView::AddColumn(), Control_CreateListView(), CreateListView(), debuglvcolumn_t(), FileTypesDlg_InitListView(), InitializeRecycleBinDlg(), InsertColumnToListView(), LISTVIEW_GetColumnT(), and LISTVIEW_InsertColumnT(). Definition at line 2536 of file commctrl.h. Referenced by add_lv_column(), CDowloadingAppsListView::AddColumn(), CAppsListView::AddColumn(), column_fill_hditem(), Control_CreateListView(), CreateListView(), CreateListViewColumns(), debuglvcolumn_t(), FileTypesDlg_InitListView(), init_listview_columns(), CNetConnectionPropertyUi::InitializeLANPropertiesUIDlg(), InitializeRecycleBinDlg(), InitInstance(), InitListViewColumns(), InputPageInitListViewColumns(), InsertColumnToListView(), LISTVIEW_GetColumnT(), LISTVIEW_InsertColumnT(), LISTVIEW_SetColumnT(), and msi_dialog_vcl_add_columns(). Definition at line 2539 of file commctrl.h. Referenced by add_lv_column(), CAppsListView::AddColumn(), column_fill_hditem(), Control_CreateListView(), CreateListView(), CreateListViewColumns(), debuglvcolumn_t(), FileTypesDlg_InitListView(), init_listview_columns(), CNetConnectionPropertyUi::InitializeLANPropertiesUIDlg(), InitializeRecycleBinDlg(), InitInstance(), InitListViewColumns(), InputPageInitListViewColumns(), InsertColumnToListView(), LISTVIEW_GetColumnT(), and msi_dialog_vcl_add_columns().